Everyone loves chili! (Right?) 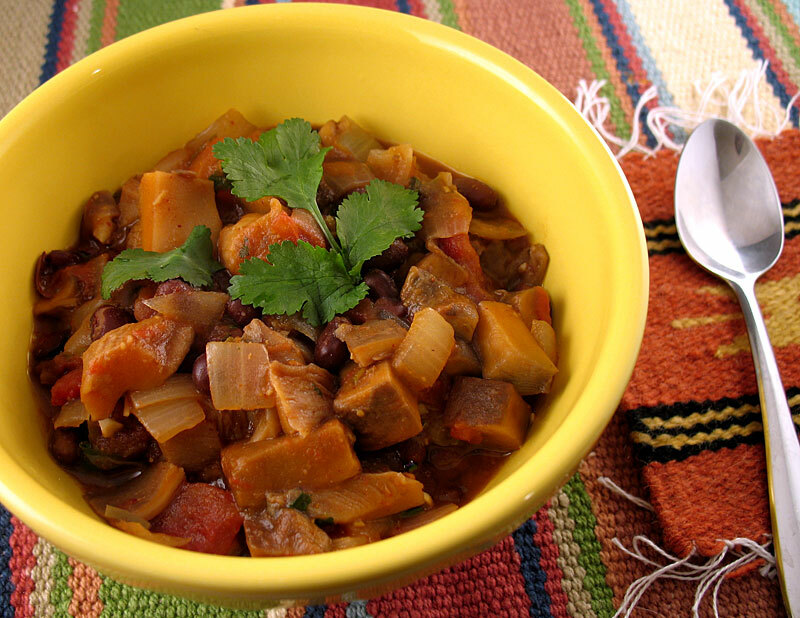 This vegetarian chili is from Great Bowls of Fire: The World’s Spiciest Soups, Chilies, Stews, and Hot Pots by Jay Solomon. It came together really quickly, and Abbie’s cornbread was a perfect accompaniment. The spice level was just right — not too hot, but definitely present. It’s been a few weeks since we actually sat down to eat this meal, so I have no memory of what was actually said. 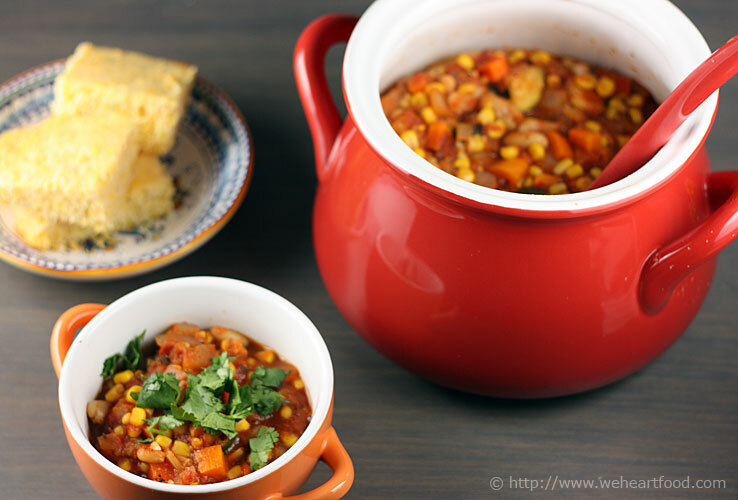 Yum, This is delicious, Could you pass the cornbread, Thank you, No problem, This isn’t very spicy, I like it, As do I, Thanks for making mine without cilantro, I love cilantro, I love corn, Good job on the cornbread, Are there any leftovers, No. In a dry skillet over medium heat, toast the dried chilies for about 2 minutes, shaking as they cook. Remove from the heat and cover with 1 cup of simmering water, then soak for 15-20 minutes. Place the chilies in a blender with 1/2 cup of the water and puree for 5 seconds. Scrape into a small bowl. In a dutch oven, heat the oil over medium heat. Add the onion, bell pepper, zucchini, carrot, and garlic, and cook for six minutes. Add the remaining ingredients and the pureed chilies and bring to a simmer. Cook for 15 minutes over medium-low heat, stirring occasionally. Remove from the heat and let stand 5-10 minutes before serving. Top with the cilantro. Jeremy and Autumn came over for dinner tonight and we enjoyed this Salmon Chili, adapted from a recipe in the McCormick & Schmick’s Seafood Restaurant Cookbook. It’s one of those healthy-but-hearty dishes that we really love. 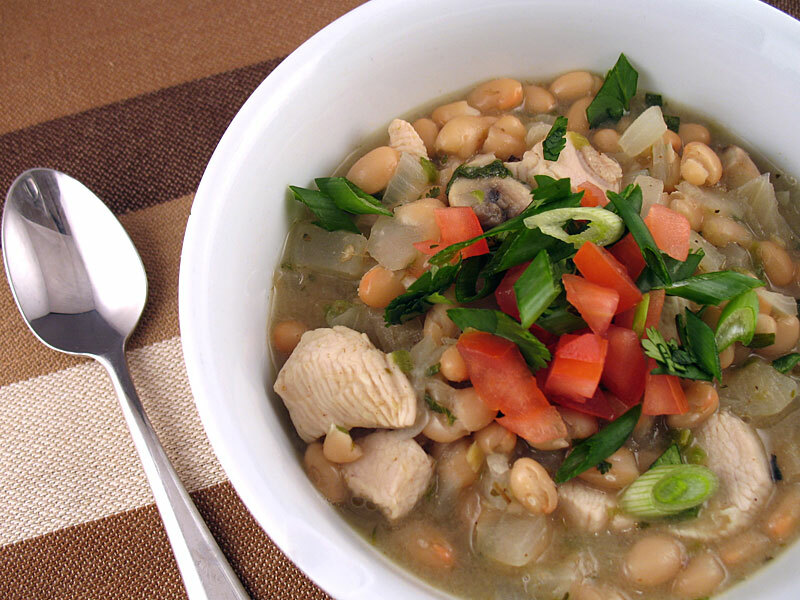 The salmon and the white beans (instead of the more-frequently-seen kidney or black beans) lightened the dish and made for a nice flavor combination. There’s a bit of Tabasco and chili powder for some kick, but this definitely isn’t a very spicy combo. We served it with Broccoli with Turmeric and Tomatoes. Great Bowls of Fire? Nope… definitely not kick-in-your-face-and-rip-out-your-tongue hot. I love it — but dammit, I had too much bread before we sat down… although now I get to have an awesome lunch. I’m glad these bowls are small; otherwise I’d feel bad about going back for thirds. Soak the white beans in water overnight. Drain, then cook the beans in 2 cups of the vegetable broth (enough to cover) until tender, about 25 minutes. If you start running out of liquid, add water. Saute the onions, celery, and peppers in the olive oil to soften. Add the garlic and cool for 1 minute. Add the wine and reduce for 1 to 2 minutes. Add the tomatoes and bring to a simmer. Drain the cooked beans and add to the pot along with the Tabasco, tomato paste, the remaining 2 cups vegetable broth, and herbs and spices. Simmer for 10-12 minutes. Add the salmon and simmer for another 3-4 minutes until just cooked through. Stir carefully to incorporate the seafood without breaking it up too much. I bookmarked this white chili recipe featured on Blue Kitchen (GREAT photos) back in November and finally got to making it this weekend. It’s definitely not the usual “ground beef and kidney beans” fare… this spices in this chili include bay leaf, oregano, and… ginger! Unusual, but subtle. We loved it. Usually I seed the jalapeños when I make chili, but since there wasn’t anything else really “hot” in the recipe, like chili powder, I left most of the seeds in. Really? I was all prepared to say “Spicy!” after my first bite, but it’s not that hot. It has a really good flavor, though. Doesn’t it? I was wondering how it was going to taste with that ginger, but it’s very subtle. It doesn’t overpower the taste at all. The toppings make it a really colorful dish. Yay cilantro! I think we’re going to have to change the name of this blog to We [Heart] Cilantro and Onions — I think we use them in 75% of the meals we make. Speaking of cilantro, what’s with these people? Heat a large sauce pan over a medium heat. Add olive oil. Add onions and jalapeño pepper and cook, stirring occasionally, for 5 minutes. Add garlic and ginger and cook until fragrant, another minute or so. Add chicken and mushrooms. Cover and cook for 5 minutes, stirring occasionally to cook chicken on all sides. Sprinkle in flour and stir to coat. Cook, stirring constantly, for 1 minute. Add broth, beans, 1/4 cup cilantro, bay leaf, oregano, cumin, salt and pepper. Cover, reduce heat and simmer until vegetables are tender and chicken is cooked through, 10 to 15 minutes. Discard bay leaf and adjust seasonings. Spoon chili into bowls and garnish with tomato, cilantro and green onion. A few nights ago we made this Mushroom Chili, as featured in The Mushroom Lover’s Mushroom Cookbook. Portobello and Oyster mushrooms really add a lot of texture and flavor to the usual beans, tomatoes, and spices. Mushrooms in chili sounded… interesting… it ended up being really good. I liked adding Chipotle Tabasco to the bowl. And I certainly didn’t miss any meat. I love all those shrooms! This was just as tasty the next day. Tell me about it — hooray for afternoon snack! Heat the oil in a large pot over medium heat. Add the onion, garlic, and jalapeño. Sauté until the onion is softened, about 4 minutes. Add the mushrooms and chili powder, coriander, and cumin. Sauté until the mushrooms have absorbed the oil and begin to shrink, about 4 minutes. Add the tomatoes, oregano, and salt. Heat to a boil, then lower to a simmer. Cover and cook until the portobellos are very soft, about 20 minutes. Add the beans and enough liquid to cover the mushroom mixture. Simmer for 10 minutes. Stir in the lime juice, cilantro, and hot pepper sauce. Adjust the seasonings to your liking. Lisa made this chili from Cooking Light; it features ground turkey, chipotle peppers, and … chocolate! It was a unique combination that went well together — the spiciness of the chilies was a nice contrast to the chocolate. 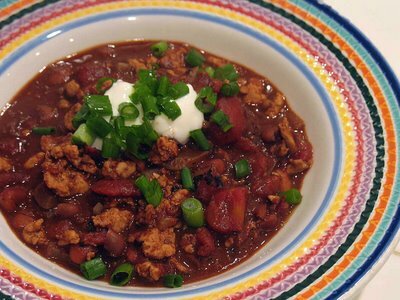 This Chocolate Chipotle Chili is Dinner and Dessert in one Dish! Wow, I’m already getting full. See? 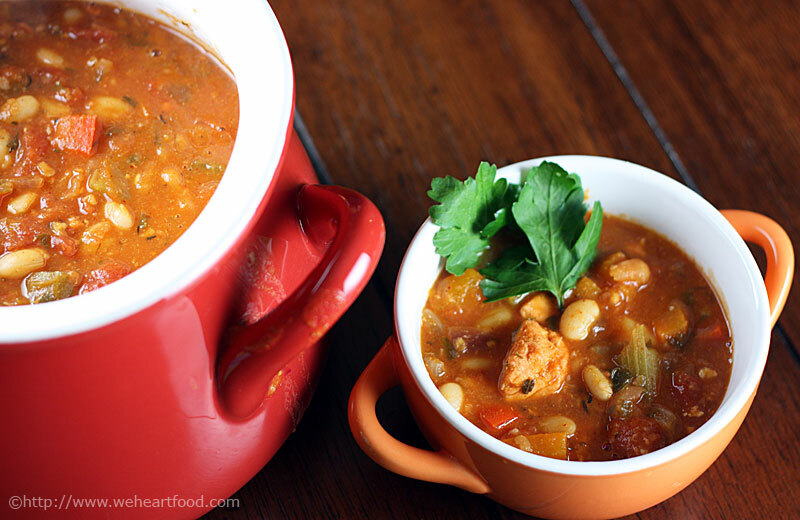 This is what I’m talking about… a soup that’s actually filling for once! That chocolate you stir in at the end thickens it up a bit. This is awesome — I wouldn’t want it all the time, but I really like the unique flavor. Heat a large saucepan over medium-high heat and coat with cooking spray. Add the turkey, onions, bell pepper, and garlic and sautee for about 8 minutes or until vegetables are tender and turkey is cooked through. Add the sugar through the chipotles to the pot and bring to a boil, stirring occasionally. Lower the heat and simmer for 15 minutes. Add *up to* 2 ounces of the chocolate, a little at a time, until you reach your desired consistency and taste.